Geeks Fish Too: House for sale? Huh? We are simply breaking ties with our house and converting completely to the mobile lifestyle. This has been our goal and we had hoped to rent the house out to help pay the bills in the long run, but after counting the costs, selling was the best option. So no worries, we're staying in the Texas Hill Country! However, we'll be moving around a lot more and hope to be able build a real shop to build fishing rods in when we are at home base in Liberty Hill. Stay tuned as big changes are coming! 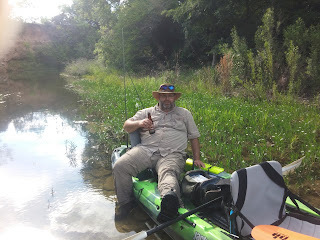 We are working on some ideas that could change things for a lot of kayak fishermen out there!! For now, we are looking forward to the next KATS tournament at Coleto Creek. Already building strategies!